Phu Yen (VNA) – Prime Minister Nguyen Xuan Phuc visited and presented gifts to residents in An Phu commune, Tuy Hoa city, the central province of Phu Yen, which was hard hit by storm Damrey, during his working visit to the province on January 18. He said he hoped the residents help one another in surmounting the storm consequences to quickly resume production and stabilize their lives. He instructed the local authorities to take measures to ensure all residents in the locality enjoy a cosy Tet with sufficient essentials and food as it is a policy of the Party, State and the Vietnam Fatherland Front. 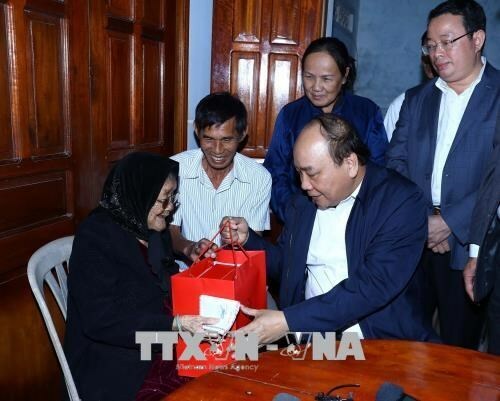 The PM visited and presented gifts to Heroic Mother Ngo Thi Muoi, 97, who has three sons -- all war martyrs, in An Phu. Earlier, he visited engineers, technicians, and workers working at the Ca Pass tunnel, which connects Phu Yen with Khanh Hoa province. The Ca Pass tunnel, the largest of its kind along the National Highway 1A, opened to traffic on August 21, 2017. It stretches 13.19 kilometres from Phu Yen province’s Hao Son commune to Khanh Hoa province’s Co Ma commune and has two bi-tube tunnels: Deo Ca (Ca Pass) tunnel (4.1 kilometres in length) and Co Ma tunnel (500 metres). The maximum speed for vehicles traveling along the tunnels is 80 kilometres per hour. The tunnel system can shorten the distance between the two central provinces by 8 kilometres, cut travelling time by half and ensure convenient traffic between central and southern regions. It is also expected to connect Nam Phu Yen economic zone and Van Phong economic zone of Khanh Hoa province and contribute to the development of industry, trade and tourism in the central and Central Highlands regions. PM Phuc stressed that the tunnel has a special meaning as it is the first of its kind built by Vietnamese.